Today, we’re happy to announce the release of MongoBooster 1.1. This release adds support for GridFS, Dark editor theme, Mark connection with color and several minor updates. Although we are showing screenshots of MongoBooster for Mac OS X, all this new features are available for Windows and Linux as well. 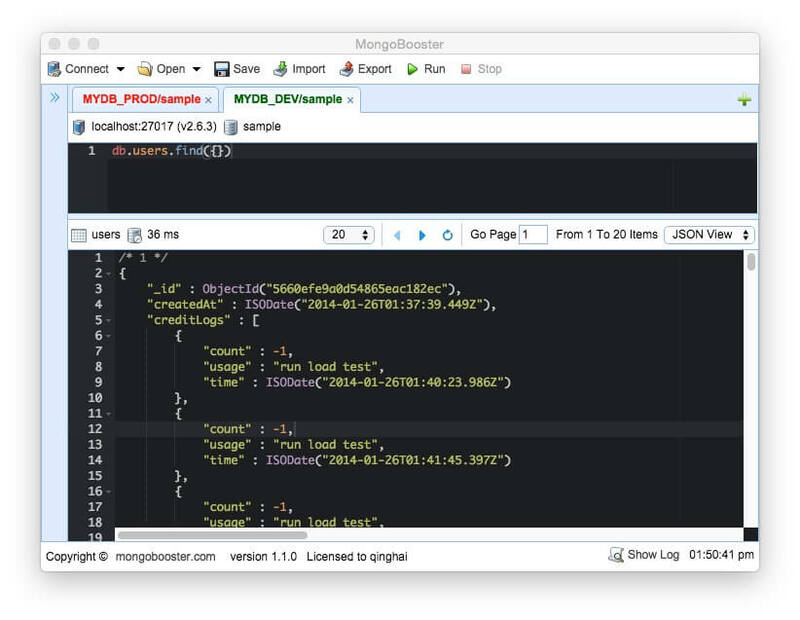 MongoBooster fully supports MongoDB’s GridFS. With our GridFS Viewer, you can read and write to GridFS collections. Files can be added easily with drag and drop. MongoBooster offers a new dark editor theme with improved syntax highlighter. When working on dev/prod databases at the same time you may unintentionally delete or update something on prod instead of dev. Now you could mark prod ones in red and dev in green. It would help you prevent this kind of mistake. MongoBooster allow moving of tabs via drag and drop reordering. Add “Server Current operations” and “Server Build Info” Right-Click Menu items in Connection node. Use “Ctrl+Alt+N” to open a new window, it is handy to analyze the results of the same query side-by-side.